Finding the best ping pong paddle that perfectly suits your playing style and ability is the cornerstone for improving your game. You can greatly benefit from a paddle if it compliments and supports your caliber. But, if it does not match your capability and technique, your game can seriously suffer. Therefore, it is vital to choose one of the best table tennis paddles. The good news is, the market is flooded with rackets of all kinds and you can choose from any number of them. For the average person though, it can be a little confusing. What specifications to look out for? Which paddle would be best for your playing level? What mistakes to avoid? It can all be a tad unnerving. That is why we are here to help you. We have already given you a list of best table tennis rackets & below are reviews of all those paddles that we have listed with pros and cons, so that you can easily choose the best one. STIGA is a leading ping pong gear manufacturer of the world. It has a long legacy of producing some of the finest paddles of all time. The STIGA Pro Carbon belongs to a premium collection of 5 different paddles designed for various levels of professional games. In fact it is the top-ranking racket in this series and boasts state-of-the-art technology and an elegant design. The STIGA Pro Carbon has a 7-ply blade with 2.0mm sponge and S5 rubbers. The blade is extra light weight and is integrated with two layers of advanced high-performance carbon. This increases the rigidity of the blade, enabling you to play faster and respond more quickly to your opponent’s shots. It also packs your shots with more power. The rubber is IITF approved. So you can use this racket to participate in competitive tournaments. The racket is ideal for beginners as well as intermediate players who need to have greater control over their shots. Weight Balance: It ensures the weight of the racket is transferred to the point where it comes in contact with the ball. Rate of Recovery: Reduction in blade weight allows for better recovery after each shot. Ball Sensitivity: Recess of the handle is strategically positioned to give more touch sensitivity. The paddle is equippedwith Nano Composite technology which ensures the rubber bonds are tighter, stronger and more cohesive so you can play faster strokes and generate more spin with the racket. The STIGA Pro Carbon also uses Balsa technology. This means the centre ply of the paddle is made of balsa wood that is ultra lightweight so you can get better speed and more reaction time. The racketis designed with Crystal technology which uses a kind of resin to harden the blade surface. The result is that the wood is more cohesive and compact, allowing the player to play speedier shots. The STIGA Pro Carbonis further equipped with ACS technology which is a signature offering of STIGA. 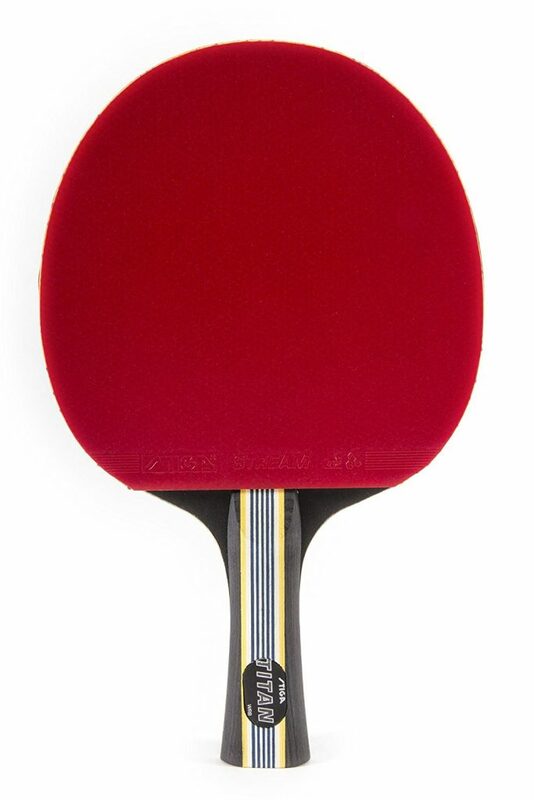 Using this technology, the paddle’s super lightweight rubber is perforated with numerous extremely tiny air pockets. This allows for greater control over shots, more elasticity and speedier shots. The STIGA Pro Carbon also has a Shock Dispersion Tube. This is essentially a hollow section of the handle that is strategically placed to absorb the shockwaves generated when the ball hits the blade and evenly distribute them throughout the paddle. The paddle handle is heavy and concave pro. Performance score: Speed = 99. Spin = 100. Control = 80. Excellent speed, spin and control. Not suitable for playing soft shots. Heavy and slightly rough handle. Not suitable for aggressive players who play far from table. Killerspin’sexclusive JET series is designed for competitive games. It starts with JET100 and goes all the way up to JET800. 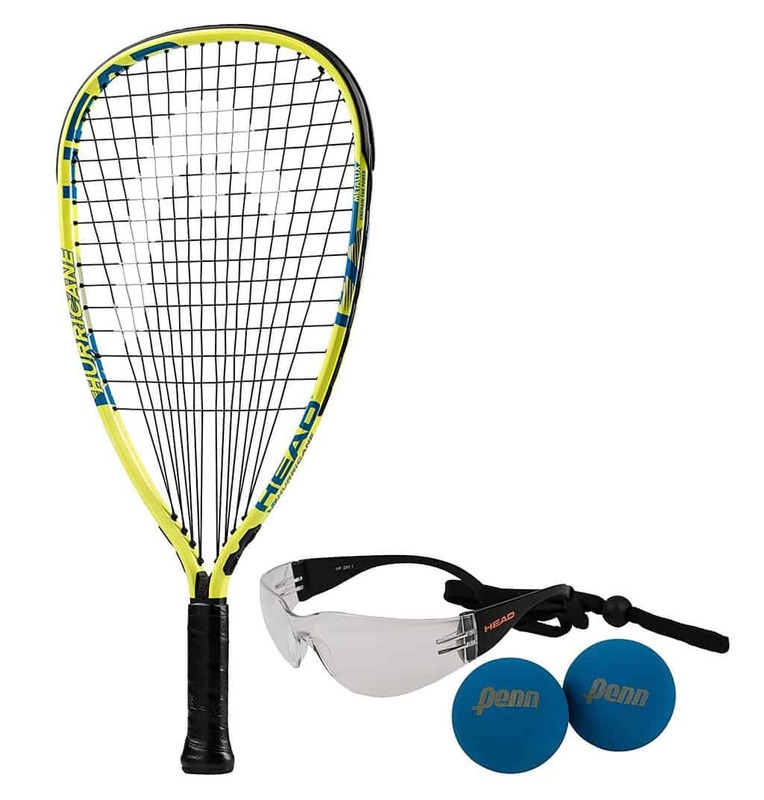 JET100 is the most basic paddle and suitable for beginners and recreational players while the JET800 is meant for serious tournaments. 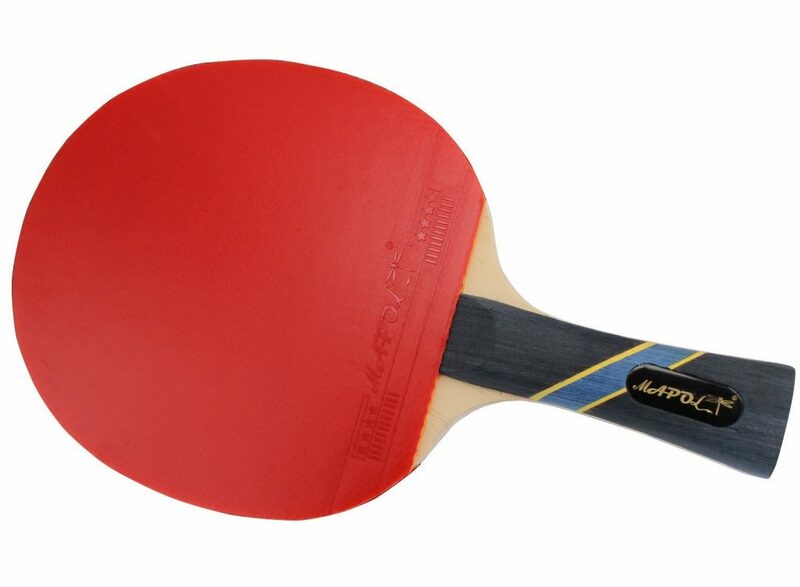 The Killerspin JET200 is, as the name suggests, one level above the JET100 and the second most basic paddle in this collection.It has a 5-ply wooden blade with two Jet Basic 1.8mm high-performance rubbers. It is the second cheapest paddle in the premade JET series. The weight is distributed evenly throughout the paddle. This offers the player superb control over their shots. It delivers precision shots with great consistency. 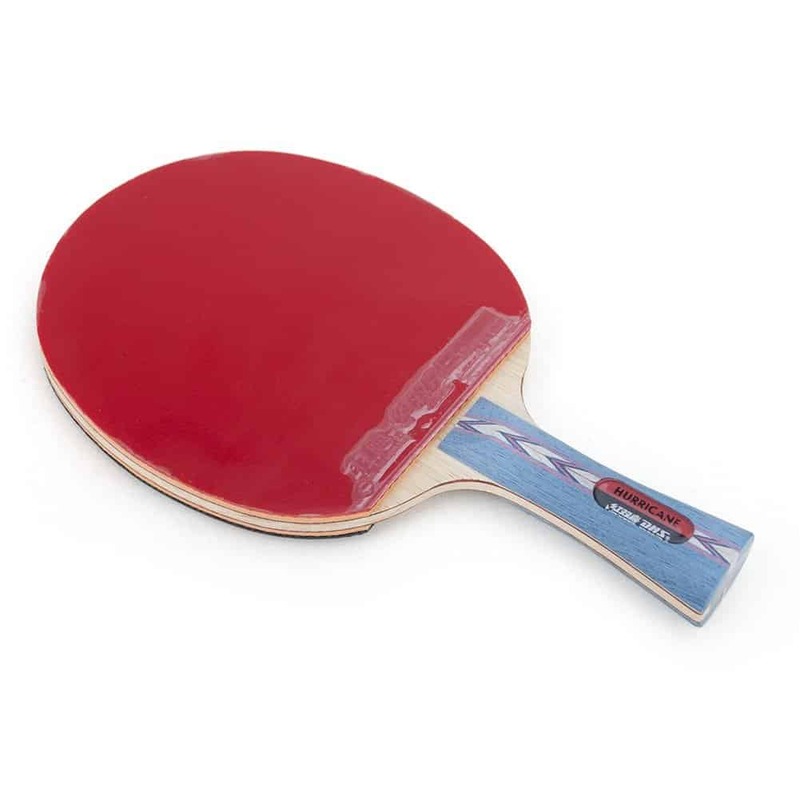 The paddle has flexible PVC side tape for better protection of the blade against damages. This paddle is perfect for beginners and recreational players who need to control their shots.It is an all-rounder paddle that can be used by all new learners. It has a flared 3-7/8-inch handle for a comfortable grip. The paddle weighs 6.2 ounces. The patented blue and black rubbers give the paddle a classy understated look. It comes in 3 exciting colors: BluVanilla, Mocha and Lime. The blade is 5.9mm thick and extra lightweight. It includes a Memory Book and a small marker pen for you to record your past performances, keep score and collect signatures. Being a beginner’s racket, the rubbers are not very tacky or sticky. You can only expect an average amount of spin from the JET200. But it is very dependable in terms of ball placement as it gives the player brilliant control over their shots. Performance score: Speed = 6. Spin = 7. Control = 8.5. It comes with a 30-day warranty. Lacks in speed and spin. The STIGA Evolution has a 6-ply light weight blade with 2.0mm Premium Rubber. The rubbers are exclusively designed to jack upthe velocity of shots and add more spin. They are certainly faster than most other premade rubbers used in making ping pong paddles. The STIGA Evolution is ideal for both beginners and intermediate players.The sponge of the paddle allows the player to control and return slams more easily. Also, it ensures accuracy and consistency of ball placement. The paddle is approved by IITF so you can play in professional leagues and tournaments with it. 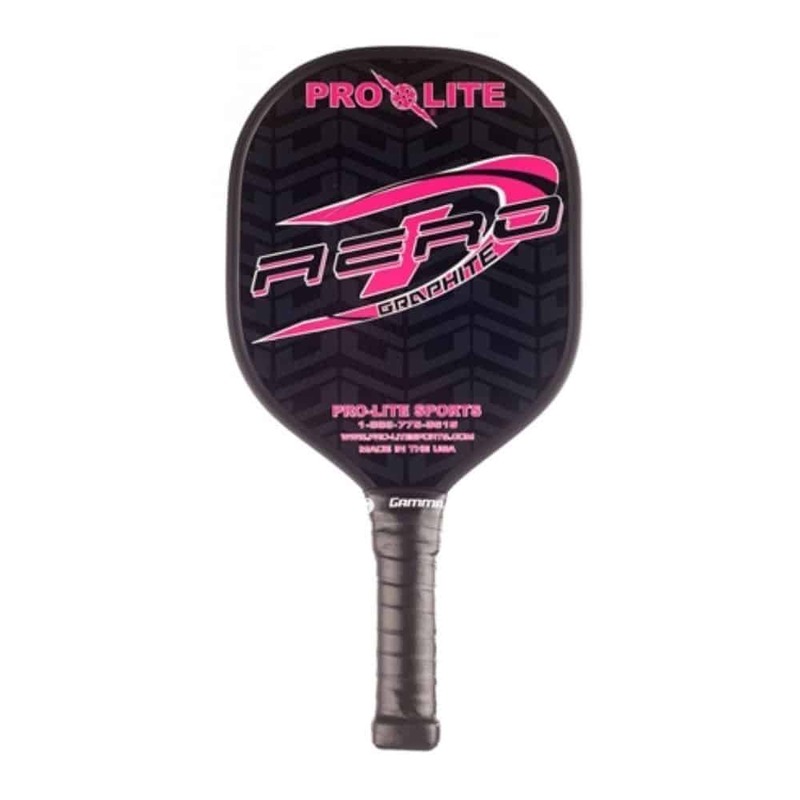 The paddle is equipped with a Shock Dispersion Tube (SDT) which is long and hollow section inside the handle strategically placed to absorb the shockwaves created when the ball hits the blade and distribute them evenly throughout the paddle. The STIGA Evolution is designed with ACS technology. As per this technology, the super lightweight rubbers are embedded with numerous extremely tiny air pockets to afford greater control over shots, more elasticity and better speed. The STIGA Evolution is further equipped with Crystal technology which hardens the blade surface using a kind of resin to increase pace of shots. The paddle has Nano Composite technology which makes the rubber bonds tighter and more cohesive so you can get more speed and spin on the ball. STIGA Evolution’s performance score is: Speed = 96. Spin = 94. Control = 90. Product dimensions are: 12” x 7.3” x 2.8”. The paddle weighs 6.4ounces. Excellent for intermediate and defensive players. Not very suitable for players who play at a distance from the table. Rim of the blade lacks extra protection against damages. The Killerspin JET600 is a very balanced paddle. It has a 5-ply wooden blade made of 5 different layers of premium quality wood. It is 6.0mm in thickness, light weight and has a dense base. This increases precision of ball placement and packs every stroke with power. The paddle also boasts 2.0mm Nitrx-4Z rubber. These special rubbers offer a mix of soft feel and extra spring, both of which greatly favor hard-hitting aggressive players. The paddle is IITF approved. This means you are legally permitted to participate in competitive professional leagues. The blade offers average control but has impressive spin and pace. It favors players with an offensive style of play who like to play at a distance from the table with hard high-spin shots. Generally speaking, this paddle is made for intermediate to advanced players. Beginners are advised not to go for it as control may be an issue. If you are an intermediate player and are looking to pace up your game, this is the paddle for you. Also, keep in mind that if you are up against an opponent who pumps a lot of spin into their shots, you will have to respond faster to be able to return their shots because shots with greater spin tend to spin off the rubbers a lot. The paddle has a flared 3-7/8-inch handle and is designed for a shakehand grip. It weighs 6.4 ounces (182 grams). Hence, it is heavier than most paddles and makes every shot more powerful. 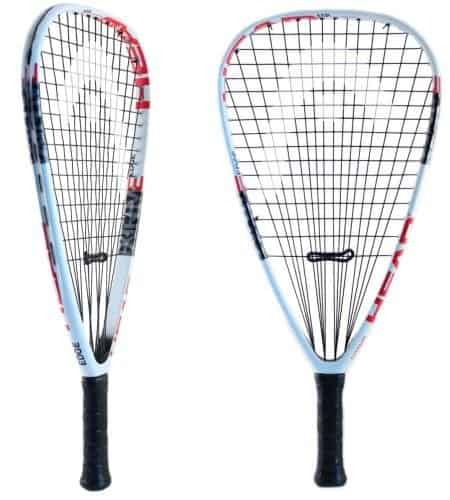 As a result of the weight of the racket and a flared handle, the racket maintains a good aggressive balance that shifts the weight to the head of the racket. The performance score is: Speed = 8. Spin = 9. Control = 8.5. The paddle has a red and black color combination. It has a 30-day warranty. The Killerspin JET600 comes in a smart convenient carton. Ideal for intermediate to advanced players with an aggressive style. Not suitable for beginners as the paddle lacks in control. Playing high-spin shots can be tricky. The STIGA Titan has a 5-ply extra light weight blade with 2.0mm sponge and Triumph Inverted Tournament Rubber. It is an IITF approved paddle. So you can use it to play in professional competitions. This paddle is perfect for beginners and intermediate players. It offers greater control over shots and allows the player to place shots more consistently. It is also affordable, lightweight and comfortable to hold. The STIGA Titan is built with the advanced STIGA WRB technology. It is a combination of 3 special features. Weight Balance: it ensures the weight of the racket is transferred to the point where it makes contact with the ball. Rate of Recovery: reduction in blade weight affords better recovery after every stroke. Ball Sensitivity: recess of the handle is placed strategically to give additional touch sensitivity. The STIGA Titan uses Balsa technology which means the centre ply is made of balsa wood which is extremely lightweight in order to give players better reaction time and speed. The Titan also uses Crystal technology which hardens the surface of the blade using a special kind of resin to enable players to deliver faster shots. The handle of the paddle is Concave Italian Composite. Performance score: Speed = 80. Spin = 77. Control = 82. Dimensions are: 12” x 7” x 3”. It weighs 5.6 ounces. Suitable for beginners and intermediates as it provides superior control over strokes. The sponge quality is not suited for powerful fast offensive shots. Does not favor aggressive playing style. The Killerspin JET800 Speed N1 is the top ranked paddle in the eight-part Killerspin JET series. It is a premium quality paddle meant for serious tournaments. Ithas a unique 7-ply wooden blade which consists of 5 layers of premium wood and two layers of carbon. This combination creates extra pop when you play aggressively and lets you pump more power into your strokes. It gives you greater control and improves your return shots. The paddle is perfect for playing an attacking game with hard-hitting shots. The paddle is made with IITF approved 2.0mm Nitrx-4Z rubber. This means you can use it to participate in competitive professional tournaments.Plus, the advantage of theNitrx-4Z rubbers is that they add extra spin, especially on harder shots and serves. They are also fairly forgiving while playing against high-spin shots and offers good defensive control. The rubbers certainly favor hard-hitting aggressive players. The JET800 offers a firmer slip-free grip and enables you to superbly counter heavy spin shots and produce your own spin on trick serves. One of the best things about the Killerspin JET800 Speed N1 is that the paddle has a wooden side tape that protectsit against breakage/chipping. It also preserves your energy so you can deliver more power-packed shots. The paddle has an ergonomically designed wooden handle with a beautiful burnt finish. Performance score of the JET 800 Speed N1 is: Speed: 9.5. Spin: 9. Control: 8. It weighs 9.4 ounces. Its dimensions are: 6.1” x 6” x 0.5”. The Killerspin JET800 Speed N1 includes a Memory Book and a small marker pen for you to record your past performances, keep score and collect signatures. 5-layer wood plus 2-layer carbon blade. Perfect for advanced players who play fast aggressive stokes. Has a faint fish-like odor. The STIGA Supreme has a 6-ply extra light weight blade with Future Inverted Rubber and 2.0mm sponge. It is an IITF approved paddle. 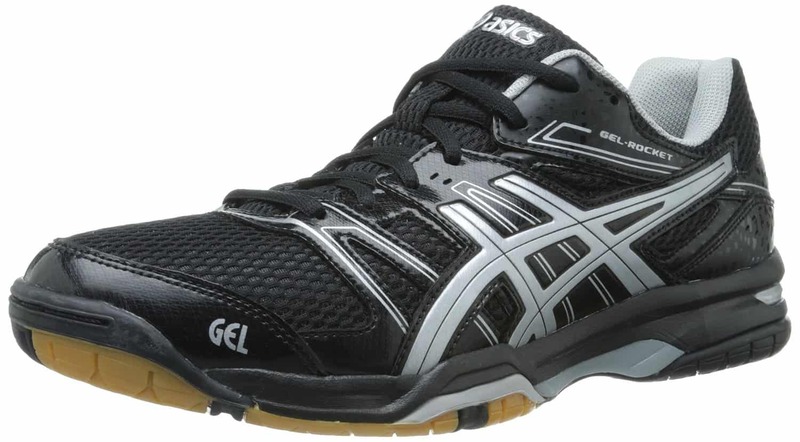 The paddle is made with ACS technology which meansthe ultra-light rubber has plenty of microscopic air pockets. This provides more elasticity, speed and control over shots. The paddle also boasts STIGA’s signature STIGA Tube. This is an advanced feature and not all STIGA paddles have it. As per this unique technology, slender ‘Micro Channels’ are made along the length of the middle ply of the blade and filled with different material according to the characteristics of the blade to get the desired effect. The STIGA Supreme is equipped with WRB technology. WRB stand for Weight Balance, Rate of Recovery and Ball Sensitivity. The paddle uses Crystal technology. This technology hardens the blade surface in order to make strokes speedier. The STIGA Supreme is made with STIGA Future rubber which means the smooth side of the rubber is exposed and comes in contact with the ball while the pimpled side faces inward and is glued to the adjacent wooden ply. This paddle benefits defensive players as it has a soft sponge. It gives greater control over shots, more spin and makes for excellent chopping, reverse return and backspin. It is a good racket for players who prefer to play close to the table. However, due to its light weight, it does not favor aggressive players as strokes may lack power and speed. The handle is made of Anatomic Italian Composite. It has a comfortable grip. Performance score: Speed = 90. Spin = 92. Control = 89. It weighs 5 ounces (142 grams) which is way lighter than most rackets. Excellent chops, service return and backspin. Not suited for loops and topspin shots. Too light-weight for aggressive playing. The MAPOL 4 Star has a 7-ply wooden blade with high-performance rubbers and 2.0mm sponge. The rubbers offer good spin and control on the ball. The paddle is best suited for beginners and intermediate player as they need to exercise more control over their shots. The MAPOL 4 Star is a slightly heavier paddle. It weighs around 205 grams. It comes in a pack of two. A carry bag made of durable fabric is included in the package. It is a convenient bag for carrying the paddles around. It has a flared handle for a comfortable grip. The paddle however lacks in power. Itmay not favor advanced-level aggressive players who play hard-hitting strokes. Speed is fairly average too. All in all, the MAPOL 4 Star is a good racket for beginners who are learning the ropes of the game and need to exercise more control over their strokes. The MAPOL 4 Stat is the most affordable ping pong paddle in the market. For roughly 19 USD (may vary from vendor to vendor) you get two paddles plus a carry bag, which is quite a steal. No other brand offers such reasonably priced rackets. Great value for money. Very affordable, comes in a pack of two. Lacks in power and pace. Some customers have complained that the rubbers separated after a few days of playing. Glue used for binding rubbers is of average quality. Not appropriate for advanced players who play attacking strokes. The DHS HURRICANE-II is designed for ashakehand grip. It has a 5-ply wooden blade with a different kind of rubber on either face of the paddle. The sponge is hard and the rubbers are tacky. It is slightly larger in size than most paddles so you can keep your opponent on their toes. The large size also lets you find your sweet spot on the table. In ping pong jargon, sweet spot means the perfect spot on the table for landing serves and returning hits. The DHS HURRICANE-II can be used to play in professional tournaments. The rubbers are IITF approved. The special DHS rubbers used in this paddle are dimpled on one side and smooth on the other. The dimpled side is glued to the rest of the paddle while the smooth face is exposed outwards and comes in contact with the ball. The advantage of having the pips inwards is that you can control your shots better. However, some players like the element of unpredictability that a pips-out paddle offers because opponents are often unable to gauge the trajectory of shots. The DHS HURRICANE-II uses two unique types of rubbers on either side of the paddle. One is called Hurricane and it is designed for aggressive playing. It is tacky, has more bounce and increases topspin. The other side has what is known as G555 rubber. Its tacky texture balances out the paddle. It gives impressive spin on the ball, better control and allows the player to respond better to the opponent’s spin shots. Most players like using the Hurricane side for forehand offence and the G555 side for backhand defense. A narrow piece of plastic guards the rubbers on both sides of the paddle. You are required to remove the plastic before playing and put it back on after every game. The plastic protects and prolongs the life of the rubbers. You can easily participate in up to 75 competitive matches before the rubbers require changing. The DHS HURRICANE-II is best suited for intermediate to advanced players who take part in competitive tournaments. It is designed for superior spin and speed and favors aggressive playing styles. Hard-hitting shots close to the table are generously rewarded but attacking shots far from the table lack power. Beginners may find this racket difficult to play with. Performance score: Speed = 8.5. Spin = 9.3. Control = 8. It weighs 2.6 pounds. The DHS HURRICANE-II comes with a smart and durable carry bag with a good quality zipper that has enough space for two rackets and two balls. Ideal for advanced players with an offensive style of playing. Protective removable plastic pieces guard rubbers. Not suitable for beginners as it lacks in control. Not suitable for playing far from the table. This paddle is ranked next to the JET800 in the Killerspin JET collection. 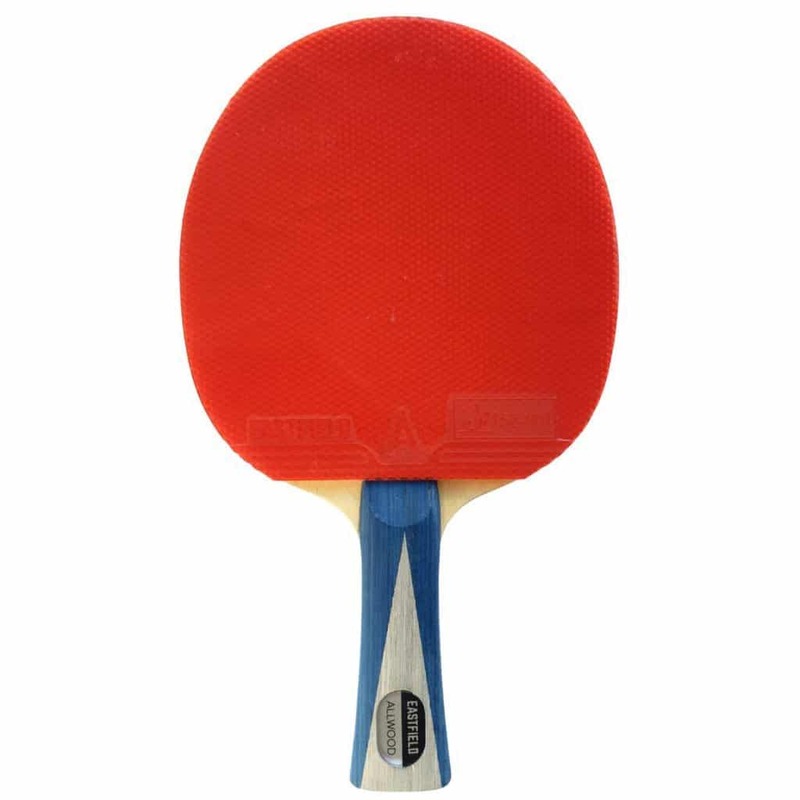 It is the second leading paddle in the JET series and is designed for competitive matches. It has a 7-ply wooden blade with 2.0mm high tension Nitrx 4Z rubbers. The main advantage of theNitrx-4Z rubbers is that they add extra spin, especially on harder shots and serves. They are also fairly forgiving while playing against high-spin shots and offer good defensive control. The rubbers favor hard-hitting aggressive players. It is IITF approved. This means you can use this paddle to participate in professional leagues. The paddle has a wooden side tape that protects the blade against damages. The JET700 pumps more power into your shots. It is specially crafted for players looking to transition from a control-oriented intermediate level to an attack-oriented advanced level. The superior Nitrx 4Z rubbers offer firmer slip-free grip and enable you to superbly counter heavy spin shots and produce your own spin on trick serves. It also lets you place your shots with great precision and consistency. On one side of the paddle the rubber is black and on the other it is red. Performance score: Speed = 9. Spin = 9. Control = 8.3. It weight about 195 grams. So it is slightly on the heavier side. Dimensions are: 8.2” x 6.7” x 2.4”. Best suited for aggressive playing style. Protective wooden side tape guards paddle against chipping/damages. The Killerspin Kido 7P is a competition racket known for its extreme levels of spin. It has a 7-ply all-wood blade with high-tension Fortissimo rubbers. The wood is highly elastic and the rubbers tacky. It is a perfect paddle for aggressive players and can be used in both intermediate and advanced levels. It is an IITF approved paddle.So you can use it to participate in competitive matches. Defensive players may find the Killerspin Kido 7Pa tad too quick for their style. Also, players who play power shots may find it a little lacking in pace. The Killerspin Kido 7P allows buyers to select the handle type they want. There are two options: straight and flared. The handle is rounded octagon in shape and 10cm long. It is also slightly narrower than most rackets. The paddle dimensions are: 11.8” x 6.5” x 1.1”. The Killerspin Kido 7P comes in a smart carton. Performance score of the Killerspin Kido 7P is: Speed = 8.7. Spin = 9.4. Control = 8.7. Suitable for offensive style of play. Does not support defensive players. High power strokes may lack pace. 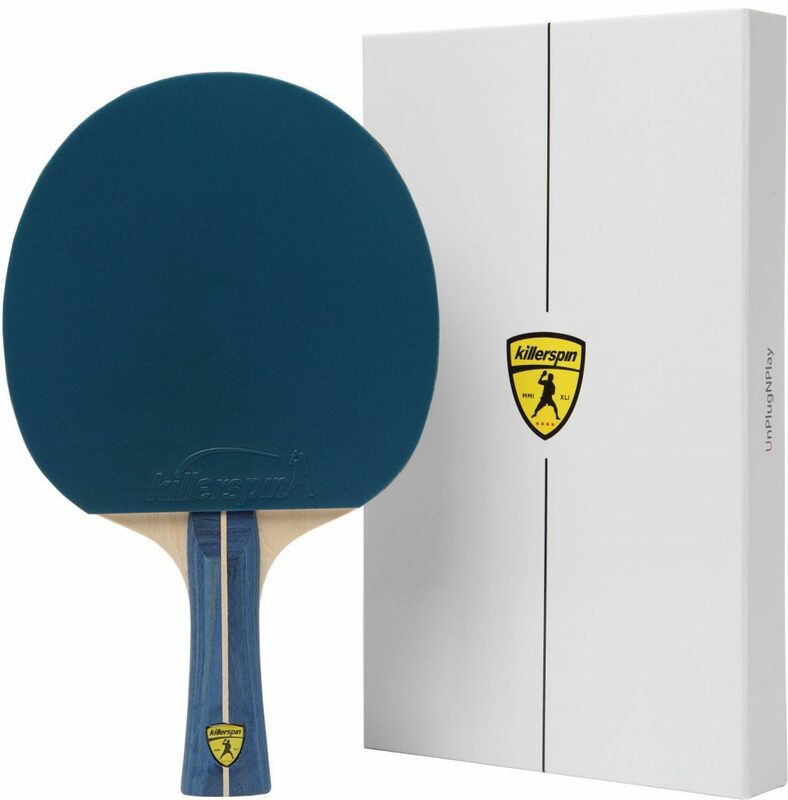 Most professional ping pong paddles are designed for indoor games. If they are exposed to the elements of nature (harsh sunlight, fog, rain, wind, sand, dust, etc.) they may not last very long. For playing ping pong out of doors, say in your backyard or garden, it is always advisable to use an outdoor racket that’s made specifically for outdoor playing. The STIGA Flow is a frontrunner among outdoor paddles. It is weather and shock resistant and can be used both indoors and outdoors. It is a good sturdy paddle for recreational players. It can be handled by children as well as adults. It is long-lasting and has a hard surface that affords greater control over strokes. All in all, it is a great ping pong paddle for your entire family and is ideal for taking on picnics and family outings. The blade is made of polypropylene and glass fibers. The handle is made of thermoplastic elastomers. The paddle supports both shakehand and penhold grips. Performance score of the STIGA Flow is: Speed = 45. Spin = 45. Control = 90. Its dimensions are: 12.3” x 7.8” x 2”. The STIGA Flow is fairly cheap. It is priced at around 17 USD but may differ from seller to seller. It comes in a smart bright leaf green and white color combination. Not IITF approved. Cannot be used in professional games. 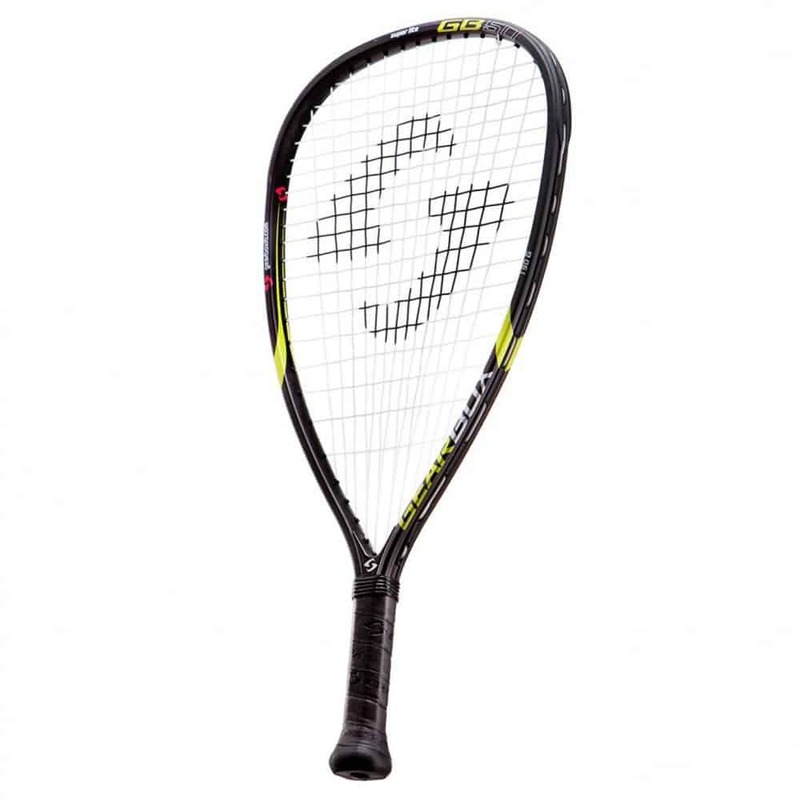 The Butterfly Balsa Carbon X5-FL is a powerful racket for aggressive playing. It has a Balsa wood core with dual carbon layers. It has a 5-ply (3 wood and 2 carbon) blade made of carbon fiber that increases speed and offers a larger sweet spot. 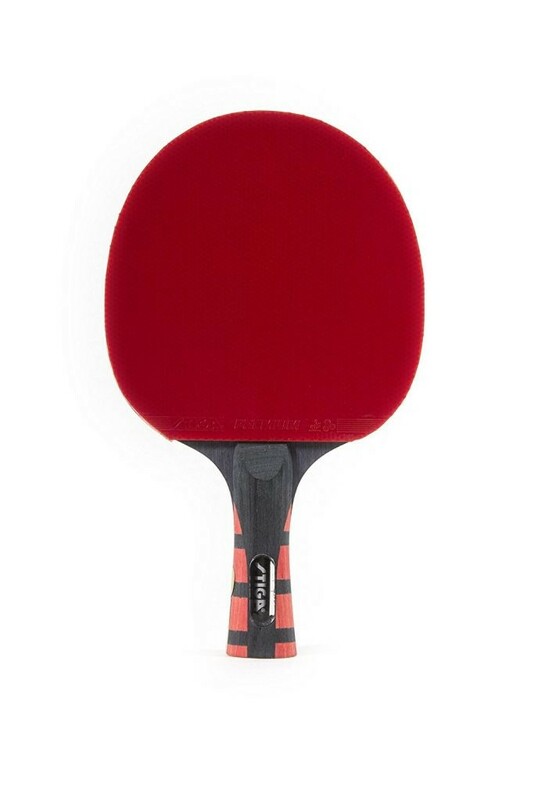 The paddle has Tenergy 80-FX rubbers that help maintain a good balance of speed and spin. These rubbers greatly favor mid-distance loopers and those who have an attacking style. It allows the player to return serves more easily, block more effectively and loop against backspin. The paddle is very lightweight, weighing around 80 grams. The surface of the blade is soft and has a great touch and feel to it. The two carbon layers give the paddle an extra soft feel which is very important for a good a blocking technique. The Butterfly Balsa Carbon X5-FL is good for playing close to the table. It can also generate powerful topspin from medium to far range from the table. Overall, it has excellent speed and power and suits players with an attacking style of play. The handle is a little thick. Performance score: Speed = 100. Spin = 95. Control = 80. Dimensions are: 11” x 7” x 1”. The handle may be a little too thick for some players. The Killerspin RTG Diamond CQ has a 7-ply blade comprising of 5 layers of wood and 2 layers of carbon. It is a Diamond CQ carbon blade specially crafted with composite material to deliver lightning-fast power-packed shots with greater control and consistent ball placement. It is a good paddle for players who have an attacking style and like to play a fast game. It is made with Fortissimo rubbers. It is IITF approved. Players have the option of selecting the handle type. There are two variants: Flared and straight. The measurement of the handle is 3 7/8 inches. The thickness of the racket is 9/16 inches. The head dimensions are: W = 6 inches. H = 6 ¼ inches. The paddle weighs 178 grams. Hence, it is slightly heavier than other paddles. Product dimensions are: 12” x 7” x 1”. Performance score is: Speed = 9.1. Spin = 9. Control = 8.3. Ideal for fast aggressive players. Handle comes in 2 variants. Control is a little weak. Not suitable for defensive players and beginners. 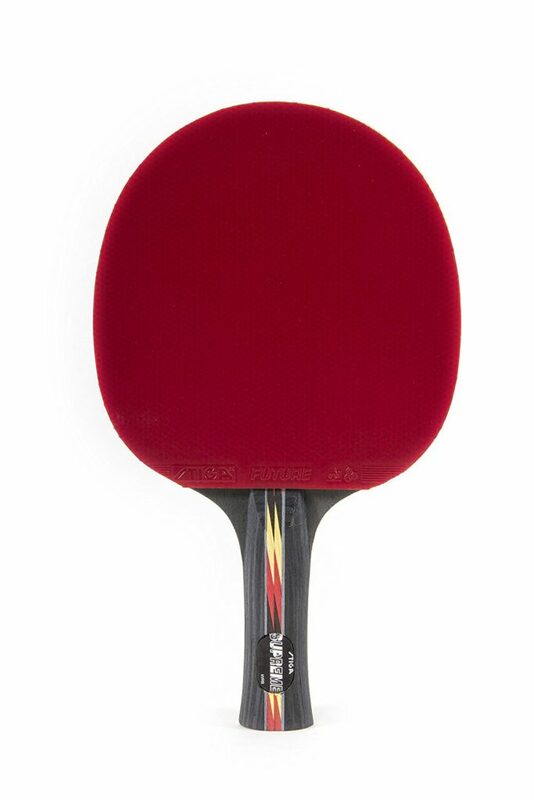 The JOOLA Spinforce 900 is the top ranked paddle in the Spinforce Series launched by JOOLA. It is an IITF approved paddle. It has a 7-tier plywood carbon blade with tailor-made JOOLA Infinity high tension rubbers that have a soft 2.2mm sponge (maximum limit allowed by IITF). The thick soft sponge generates incredible amounts of spin which is the USP of the JOOLA Spinforce 900. It is the perfect racket for players learning to play an offensively with advanced spin shots. Beginners and intermediate players can also benefit from this racket if they are looking to develop their spin shots and play a more aggressive game.The paddle can also be used by defensive players. It has a flared handle that supports both backhand and forehand strokes. The rubbers can be periodically removed and replaced to upgrade the paddle’s performance. Performance score: Speed = 9. Spin = 9.5. Control = 9. Its dimensions are: 10” x 6” x 1”. It weighs 8 ounces (226 grams). Suits beginners who want to play more offensively. Some customers have complained that the rubbers began to peel off after couple months of playing. Before we start on the guide, there is one thing that needs to be settled. Ping pong and table tennis are one and the same sport. They can be used interchangeably and mean the same thing. The sport was originally known as ping pong and it was very popular in the 1900s in America. However, table tennis is now universally accepted as the modern official name of the sport. What is your level of proficiency? Do you have a shakehand or a penhold grip? Are you a recreational player or are you training to participate in competitive leagues? Is a wooden paddle better than a plastic one? What role do different kinds of rubbers play? Does the thickness of the blade matter? How does weight of the paddleinfluence performance? What is the difference between a hard and soft sponge? Does it matter how many plies a paddle is made of? Are rackets with carbon in them better? In the following paragraphs, we will walk you through everything you need to know that will help you buy one of the best ping pong paddles. Our objective is to help you make an informed decision so you can buy the right paddle that supports your technique and ability. A ping pong paddle has 4 parts: top sheet, rubbers/sponge, blade and handle. The top sheet is the outermost rubber covering followed by the rubbers, also called sponge, which are glued to the blade which is the core of the paddle and mostly made of wood. The blade is joined to the handle which also is made of wood. Varying thickness levels of the top sheet, sponge and wooden core offer different advantages to different players. The thumb rule says the blade of a ping pong paddle must be made of at least 85% natural genuine wood. Of course, there may be trace of carbon fiber, compressed paper and glass fiber. But these cannot exceed 7.5% of the total thickness of the blade. Adding carbon fiber hardens the blade and makes it faster and enlarges the sweet spot.But carbon blades are expensive and mostly recommended for advanced levels of playing. It is important to choose a paddle with the right number of plies, type of rubbers and sponge that will compliment your performance.Remember, the thicker the blade, i.e. the more the number of plies, the harder the blade surface. And a hard blade is any day faster than a soft blade. But harder blades do not have much control due to the natural rebound of the wood. Thin blades made of less number of plies are softer and more flexible. They offer more control but lack in speed. If you play with a lot of loops, we advise you to stick to a 5-ply blade. But if you are looking to block and drive, we suggest you choose a paddle with 7 plies. If you are looking for speed and power, your paddle must have at least 5 plies of wood. If it has a couple additional layers of carbon fiber or Titanium fiber, better still. If you want more spin in your shots, you need to look for paddles with tacky high-tension rubbers. Paddles with rubbers on both sides offer more options. You can have a different kind of rubber on each face. The thicker the sponge, the faster your shots. But a thick sponge lacks in control. A thinner sponge offers better control but is slower. Aggressive players will benefit from a thick sponge. Typically, a sponge that is less than 1.3mm thick is good for defensive play as it gives the player more control. Rubbers in the 1.4mm to 1.8mm range offer good balance between offense and control and are therefore preferred by all-rounders. Rubbers thicker than 1.9mm are designed for all-out aggressive players who like to play powerful spin shots. However, thick sponges have reduced control. If you are a defensive player we recommend you pick up a lightweight paddle, if you are an all-rounder select a medium-weight one and if you have an aggressive style of play, we advise you to go for a heavy paddle. The heavier the paddle, the more power-packed your shots will be. 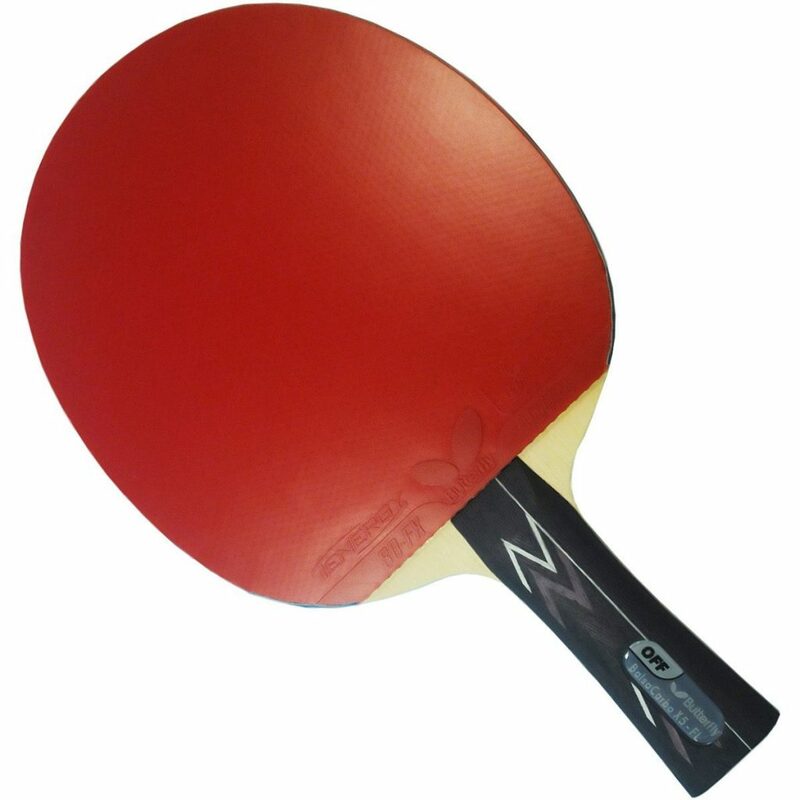 If you play close to the table, a lighter paddle will suit you as it will let you react faster. Heavy paddles suit players who play far from the table because the weight is needed to pump power into shots so that they can smoothly travel the extra distance. Heavier paddles give more spin and control but have slower reaction time because of the weight. The shakehand grip is popular in the West while in the East it is the penhold grip that has more takers. Both grips have their plus and minus points. A shakehand grip enables you to make powerful returns and apply more spin on the ball. A penhold grip lets the arm be in a more natural position to play rapid brushing strokes. A shakehand grip is more useful for beginners as it lets them play a wide range of shots. Penhold paddles come in two types: Chinese Penhold and Japanese Penhold. Chinese Penholds have a shorter handle and smaller circular heads. Japanese Penholds have a rectangular paddle head and the sides of the handle are protruded to offer better grip. Penhold paddles are great at forehand shots but weak in backhand which is often exploited by the opponent. Under the shakehand umbrella, there are three options for handle types: anatomic, flared and straight. Anatomic handles are ergonomically designed and are very comfortable to hold as they fit into the hollow of your palm perfectly. Flared handles are recommended for aggressive players. They prevent the paddle from slipping in the player’s hand.Straight handles are good for defensive players. They are easy to rotate and allow players to quickly change their grip for forehand to backhand. But straight handles are not slip-free. There are typically two kinds of rubbers: pips out and reverse rubber. The biggest advantage of pips out rubbers is that they allow you to add incredible amounts of spin to your blocks and return shots. They are great for defensive play but lack in control and have limited stroke options. Reverse rubbers on the other hand let you play a wide range of shots. They are normally used by aggressive player and they provide better control. We hope our best ping pong paddle buyer’s guide was comprehensive enough and answered all your queries & now you can easily one of the best ping pong paddles in the world. Happy shopping! Thanks for giving this list of best table tennis paddles. I have bought Killerspin JET200 and it is just awesome. Thanks big time for the help. 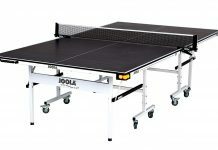 Have been searching for best table tennis bats uk as I sometimes found it difficult to get quality table tennis bats in UK shops, so I look online as I get to read reviews and then I can order them online via amazon.co.uk which I think is the best place to buy best table tennis bats in the world right now.